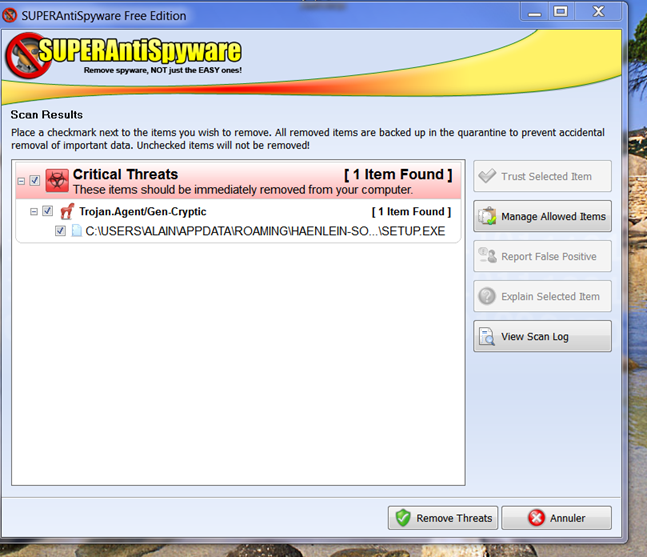 After installation of the software I have done a scan with my antispyware. I get this abnormal report going from HAELIN software. Why a TROJAN agent coming from your software ??? Please, can you investigate ? Wie üblich habe ich auf den Virenscanner hingewiesen. Seems SUPERantiSpyware fixed the problem with SETUP.EXE file. I have done some investigation and I believe I have tracked down and altered the definition causing this particular false positive. Database version 10947 should be published within the next few hours and this file should no longer be detected. I am a user of DVR Studio HD product from HAENLEIN SOFTWARE. I am migrating from HD 2 to HD 3 version. On my PC the Version 2 and Version 3 coexist. Seems the suspected file is the SETUP.exe file of HD 2 version. As the SETUP.EXE is a suspected file, messagerie MS OUTLOOK can not send you. May be it is better to contact HAENLEIN SOFTWARE directly ? Ralf HAENLEIN is the manager. I copy him this mail. Jake with our support team let me know that your software is being detected falsely as a Trojan Horse. If you could please send me a copy of the file(s) that are causing a false detection I will be able investigate the matter further. I'm happy to inform you that this particular false positive detection has been resolved. Gemeldet wird das am 25.12. um 12:12 und am 30.12.13 um 19:09 war das Thema erledigt. In Anbetracht der Tatsache dass es an Heilig Abend gemeldet wurde und Feiertage folgten, eine Reaktionszeit, an der such andere Hersteller erst mal messen lassen müssen.